Using any computer, add the missing people to the contacts list of one of your online accounts, like Gmail, Hotmail, or Outlook. Befriending them on Facebook does the trick, too. Once a person appears in a social network or one of your online contacts lists, the People app will automatically pull that person’s details into your tablet. Manually type your contact’s information into the People app. This isn’t a one-way street, either; the People app will add your hand-typed information to the online account of your choice, too. Tap the Start screen’s People tile to load the People app. When the People app appears, make sure you’re on the Home page: Slide your finger up from the screen’s bottom edge and tap the Home icon. Slide your finger up slightly from the screen’s bottom edge to fetch the App bar. Then tap the New icon. 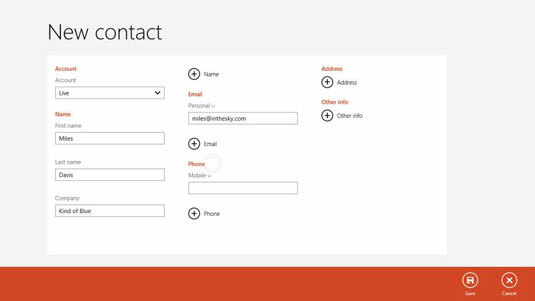 A blank New Contact form appears, ready for you to type the contact’s details. Fill out the New Contact form. Type your contact’s details, including name, address, e-mail, and phone. To add other information, tap the Other Info button. There, you can add tidbits such as a job title, website, significant other, or notes that don’t fit anywhere else. If you entered more than one online account into the People app, the Account field in the top-left corner lets you choose which account should also be updated with the new contact. Android phone owners should choose their Google account, which will update your phone, as well. Microsoft phone owners should choose their Microsoft account associated with their phone, so the person will appear there. The People app saves your new contact, both on your tablet and on the account you choose in Step 3.